An esophageal stricture is a gradual narrowing of the esophagus, which can lead to swallowing difficulties, and doctors diagnosis it in about 10 percent of their patients who have GERD (gastroesophageal reflux disease). One of the causes of esophageal strictures is gastroesophageal reflux disease, or GERD, a condition in which excessive acid is refluxed from the stomach up into the esophagus. This causes an inflammation in the lower part of the esophagus. Scarring will result after repeated inflammatory injury and healing, re-injury and re-healing, and eventually, the scarring leads to narrowing of the esophagus. If your esophageal stricture is from GERD, you may also experience heartburn, stomach or chest pain, bad breath, burning sensation in your throat or mouth, cough, sore throat, or a change in your voice. A barium swallow—patient will swallow a substance called barium and x-rays are taken as the barium moves down the esophagus. If a stricture is present, the barium will move slowly or may get stuck. An endoscopy exam—this is a procedure performed by a gastroenterologist. It entails placing a narrow tube that has a light and camera on it into the mouth, down the esophagus, and into the stomach. It allows the doctor to visualize the inside of your esophagus to see if there is any narrowing or other abnormalities. 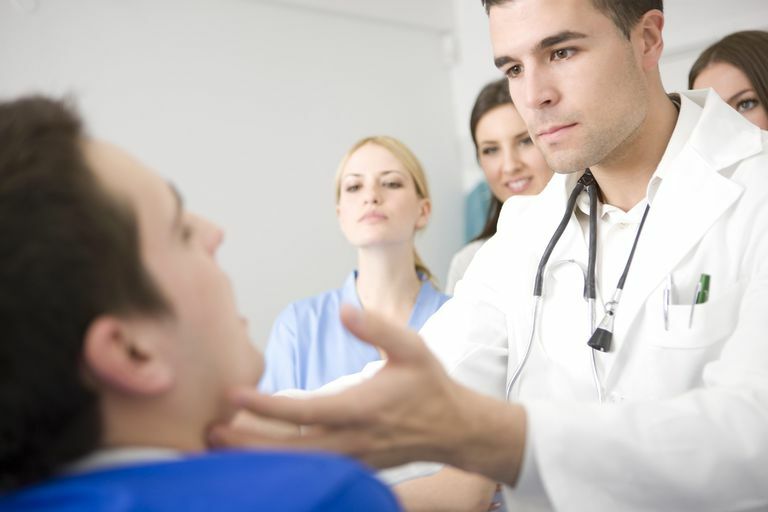 The main treatment for esophageal stricture is through a procedure called dilation. In this procedure, the esophagus is stretched by the use of either multiple dilators or an air-filled balloon, that is passed through an endoscope. There is a very low rate of serious complications related to esophageal dilation, and they include bleeding and perforation (when a hole forms in the esophagus). While this therapy treats the vast majority of strictures, repeated dilation may be necessary to prevent the stricture from returning. In fact, a recurring stricture occurs in about 30 percent of people after dilation within the first year, according to an article in Current Treatment Options in Gastroenterology. Proton pump inhibitors, such as Prilosec (omeprazole), (Nexium) lansoprazole or (AcipHex) rabeprazole, can also keep strictures from returning. These are usually prescribed after the procedure, if a person is not already taking one. The good news is that after treatment, a person can usually go back to regular routines and diets, although they may develop strictures again in the future, so have to watch out for recurrent problems swallowing. Surgical treatment of an esophageal stricture is rarely necessary. It is performed if a stricture can't be dilated enough to allow solid food to pass through. In fact, not getting enough fluids and nutrition is a serious complication of esophageal strictures. Another serious complication is the increased risk of regurgitated food, fluid, or vomit entering the lungs and causing choking or aspiration pneumonia. Surgery is also performed if repeated dilations do not keep these strictures from returning. Sometimes other procedures are considered when strictures keep recurring, including dilation therapy with steroid injections or stent placement. American Society for Gastrointestinal Endoscopy. Understanding Esophageal Dilation. Fass R. (May 2016). Overview of dysphagia in adults. In: UpToDate, Feldman M (Ed), UpToDate, Waltham, MA. van Boeckel PGA. Siersema PD. Refractory esophageal strictures: What to do when dilation fails. Curr Treat Options Gastroenterol. 2015;13(1):47-58. Why Is Your Esophagus so Inflamed and Swollen?